Nobody knows why the large boulders of Melville Peninsula stand upon small stones, nor who placed them there. This photo clearly shows two stones placed one upon the other under a corner of the boulder. One of the unsolved mysteries of the Arctic concerns a scattering of huge boulders which are to be found, supported on smaller rocks, at the upper end of Melville Peninsula. Nobody knows why they were thus raised, nor how the people who placed them in position were able to lift such enormous weights. Eetigaseemaute the Inuit call them, meaning “that which is raised from the ground.” But none of the people I questioned when I was serving at Igloolik post claimed any knowledge of how the feat of raising them was performed, nor why. They simply replied that once the Illisimayoke—the informed white man—saw them, he would be enlightened. However, the Inuit have no hesitation in explaining who put them there. It was the Toonikduak, a race of comparative giants who lived in stone houses, many of which can still be seen today, on the summits of small hills. These houses were similar in design to the present day snowhouse, but had a much smaller sleeping bench. To us this would imply a people of small, rather than great, stature; but not so to the Inuit. His legends describe the Toonik as big, powerful people, but with the mentality of children, who slept with their feet up the wall. Hence the small sleeping bench! This odd position apparently gave them greater use of their legs in walking and running. Though this may sound ridiculous, there is little doubt that the Toonik were men of great strength. 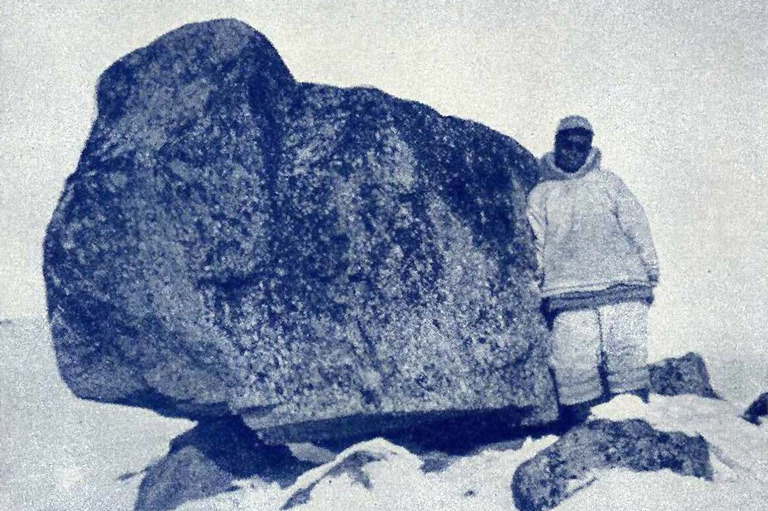 The huge stones used in the construction of their houses, and the lack of any mechanical aids in setting up these monumental stones, combined with the numerous legends the Inuit relate about them, help to confirm this theory. Putting these stones in position must have been comparatively easy. But why was it done? One of these tales I fell heir to, and told in all seriousness, was about two Inuit who while out hunting, came upon fresh bear tracks which they immediately began to follow. Unknown to them, a Toonik had also crossed the bear’s tracks a few miles farther ahead. Being swifter of foot he very soon caught up with the bear and killed it. He was about to start skinning the animal when the two Inuit appeared on the scene. At once on the defensive, the Toonik picked up the bear, laid it across his shoulders and made off with it! I should add that, though Europeans are often inclined to exaggerate a story for the benefit of the listener, the Inuit has no interest in whether we accept his tale or not. To him the impression we get is of no importance. Indeed had no enquiry been made, the tale would not have been told. The great stone monuments which these Tooniks are supposed to have erected are of varying sizes, some of them weighing many tons. They bear neither carvings nor inscriptions, merely consisting of the native rock, red granite, mounted on four stones, with the whole structure sitting upon surface rock. The most intriguing specimens are the leaning stones. They also vary greatly in size, but are all canted at an angle of about 15 degrees to the horizontal, one end resting on the ground and the opposite end supported by two stones. These boulders almost all point northeast and southwest. The horizontal rocks are to be found mainly on the edges of valleys, or on the crests of hills. On travelling up the valleys, one can often see them silhouetted against the sky, giving an impression not unlike an altar. There appears to be no uniformity in their setting, none in regard to their distance apart, though at times two or three are to be found within a few yards of each other. The leaning stones are situated at the heads of valleys, in areas commanding a view of two or three miles. The supports are not so clearly visible in this picture; however, they are there, partly hidden by the snow. 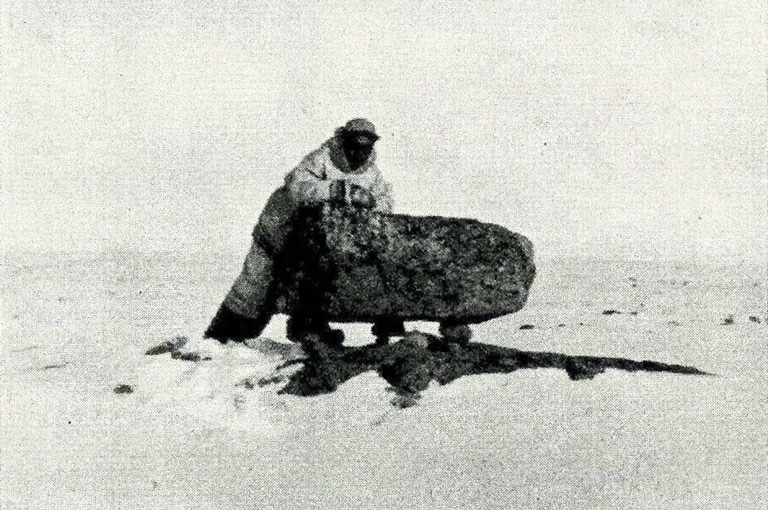 One possible way such bulk and weight could be moved, would be by rolling the boulders onto two of the base stones, with the aid of skin lines used in the parbuckle system. Then lifting the opposite end and placing the other two stones underneath. This sounds very simple, but the power required to lift such a weight would call for more men (as we know them) than could stand around its base. Probably the chief question relating to these monuments, is why were they put there. For what purpose did they go to that tremendous effort of erecting such stones, so numerous, over such a wide area. Perhaps the fact they are in good caribou country would indicate some purpose connected with hunting. Were they raised to persuade strangers who invaded their territory, that a race of giants inhabited these parts, leaving the intruder’s imagination full play and thus discouraging any infringement on their hunting rights? Or did they simply employ their idle moments erecting these stones as a feat of strength, while waiting for the caribou to arrive? Photos of some of the boulders have been sent to the eminent Danish anthropologists Dr. Kaj Birket-Smith and Dr. Helge Larsen, but they can shed no light on their origin. Sir Edward Parry and Capt. G.F. Lyon, who spent the winter of 1822–3 at Igloolik and did some travelling on the northern part of Melville Peninsula, do not mention them in their books. Perhaps, like some of the cromlechs and menhirs of the Old World, they will always remain a mystery. This great mass of rock was beyond the powers of the Toonik to raise. But the stones were apparently placed ready at the corners. A copy of this article and a print of the first photo were sent to A.E. Porsild of the National Museum in Ottawa, for comment. He showed them to G.W. Rowley and T.H. 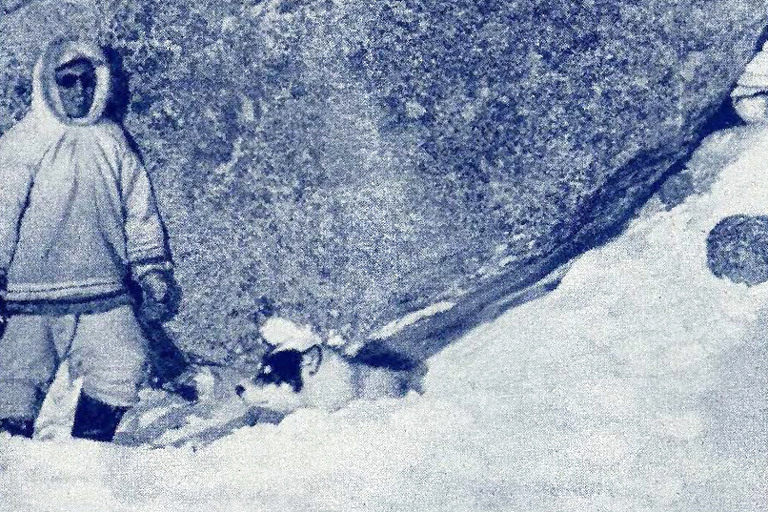 Manning, both experienced Arctic travellers, and the suggestion was put forward by Col. Rowley (and agreed to by the others) that the stones under the boulders may be merely the remnants of several that had originally been deposited by glacial action. 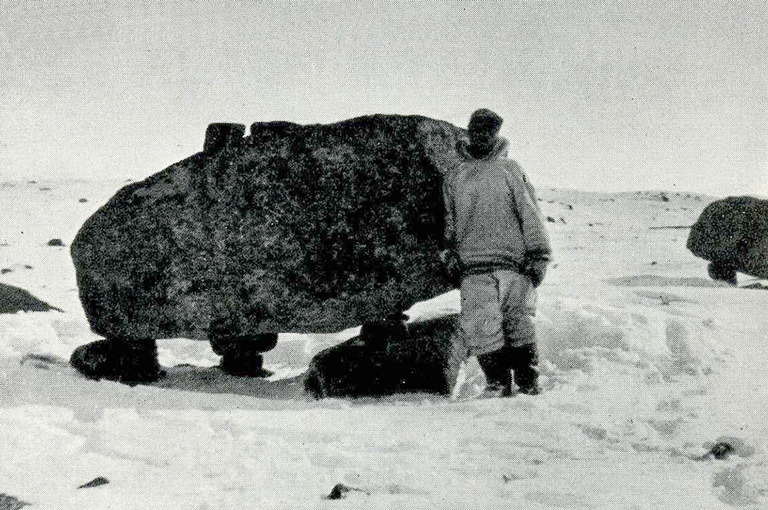 The Inuit may have used the boulders as meat caches by placing the meat on top out of the reach of animals; and they may have removed all but the key supports for two reasons: 1. To make it more difficult for the animals to get on top of the boulders; 2. To prevent snowdrifts forming at the bases. It is unlikely that a small boulder like the one at the bottom of the opposite page would be used as a cache, since any Arctic animal larger than a lemming could jump on top of it. But it may have been used as a landmark, and the stones placed under it to prevent it drifting up. E.H. Mitchell came out from Scotland (with his bagpipes) in 1949 or 1950 to join the HBC fur trade. After being a clerk at Igloolik he is now manager at Arctic Bay, still farther north. He is apparently the first to have written about these boulders. This article is an edited version of one that originally appeared in the December 1953 issue of The Beaver.